My Saturday morning started with a trip to the mailbox and much to my delight this is what I found. So, how did I come by this wonderful goody? I won it! She had a give away recently and this was my gift. I LOVE IT! Thanks so much Debbie! It will make me Happy every time I look at it! "A cheerful heart doeth good like a medicine." What a lovely gift to receive. I agree Sarah! Gifts are always So Fun! 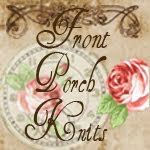 I love Debbie's blog and her etsy shop. She is just the sweetest!